Well this is now A’s new website. It is a work in progress so be patient with me. I have a web designer working on it for me as well. As you all know, I would really appreciate if you do NOT add this to your blog list. There are reasons I had to go private before and I just don’t want certain people finding this new site. That is why we are now referring to my boy as “A”. So if you have A on your blog list, just leave his old address listed as I do not want this listed anywhere. SO PLEASE DO NOT HAVE THIS AS A LINK ON YOUR PAGE!!!! Thanks everyone! So it has been kind of crazy around here once again. On October 16th my little man was really struggling in the morning. So much that I really thought that he was possibly heading into respiratory failure again as he did he March. By lunch time I was nervous so I took him into his doctor. I was so positive that we were going to be admitted that I packed all of my bags and A’s bags before heading. He was requiring oxygen at times and was struggling to breathe. So we got him into the doctor and he was NOT concerned about him! He said that his throat was kind of red and irritated so he placed him on an antibiotic to be safe and then sent us for an x-ray. Saturday morning (the 17th) his doctor called to tell me that his x-ray actually looked pretty good. I couldn’t believe it. Friday night was HORRIBLE. A had to sleep in his chair and every time that he fell asleep his sats would drop to the 70s and stay there. If I woke him up he was above 90. I cried and cried because I felt really bad for him suffering, but I didn’t know what else to do for him. I told his doctor that I was really angry and that I felt something more was going on. He told me if I was that worried about A that I should take him to the ER. Ummm that is why I brought him to see YOU, so we could avoid the ER! Anyhow, on Tuesday the 20th we had an appointment anyways with his respirologist at Mac that I absolutely LOVE. It is the vent clinic that A is now under even though he isn’t trached. We did a cap gas first which showed that his CO2 was at 54 and his O2 at 75. He was very junky and had needed a lot of suctioning over the weekend. They did swabs for viruses and then his swab to check for pseudomonas. He wondered why A was on the antibiotic that he was on and stressed that when it comes to A that doctors really need to be more aggressive. He has very crappy lungs and anything can happen. So he placed him on cipro (in case the pseudomonas was active) and on prednisone as well as many extra breathing treatments. I felt MUCH better walking out of there because I feel like this doctor is so PRO active with A. It is about time that someone really cares for this kid and his well being! So A and I spent just over a week sleeping on the couch together and trying to keep him out of hospital. As of today, he is doing wonderful! On another note, I really need people to send lots of love and prayers to Auntie A (my sister in law), my brother and her family and friends. As most of you know, about 18 months ago she was diagnosed with cardiomyopathy with a heart function of 20%. She has stayed so positive and strong that it is just amazing! Well for about the past three months she has been telling her cardiologist that she has severe stomach pain, is nauseous 24/7 and cannot eat. He told her that it was probably her GI issues/gallbladder. Twice she almost had her gallbladder removed which would have been for NO reason. Long story short, she ended up in hospital on the 5th of October after going to a class for people with heart conditions. There was a pamphlet given out with symptoms of heart failure. She had them. These were what she had been complaining about to her doctor for months. It was then she found out that she was in severe congestive heart failure. October 12th she was transferred to Toronto General. It was there that she started to really rapidly decline. Last week she was officially listed for a heart transplant. However with her poor days they just couldn’t let her go as she was. On Friday October 23rd she had a code blue called. I went and saw her on Saturday and she was HORRIBLE. I couldn’t believe how much she had deteriorated since I saw her last which was only four days prior. Sunday it was decided that she needed to have the LVAD (left ventricular assist device) placed. 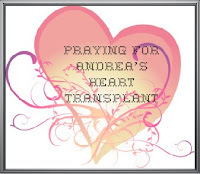 They were hoping to avoid this until this coming Friday because they didn’t want to do the LVAD and a heart transplant as it would be very hard on her. However a heart had not come yet and she could not keep going the way that she was. I was up at the hospital last night to see her and spend some time with my brother. She was very tired and in a lot of pain. The things this girl has gone through are just incredible. Her fight is inspiring to say the least. Please keep praying for her and all who love her. This entry was posted on October 28, 2009 by A's Mommy. It was filed under Uncategorized and was tagged with antibiotics, auntie A, CO2, code blue, heart failure, heart transplant, LVAD, oxygen, prayers, pseudomonas, respirology, sick, spells, vent clinic.